Speaking up and advocating for something you love, can be a rewarding experience. It can also be overwhelming and intimidating, but if you push through, the rewards far outnumber the ‘what if’s’. This is a lesson I learned first-hand last week by participating on a panel for CropLife America’s 2014 Policy Conference. Traveling across the country to speak about what I do was a massive shock to my system, in the best way possible. I was not the only multi-generation ag woman at this conference. My new friend Julia Dedes, was in the audience. In fact, I noticed her because she spoke up. She identified herself as a farm kid, then proceeded to blow the room away with a stellar question. I was so impressed, I turned around and took a picture of her, so I could lurk her later. My lurker picture of Julia. As a fellow farm kid, I wanted to hug her! I did speak with Julia after the conference and we also connected on twitter. 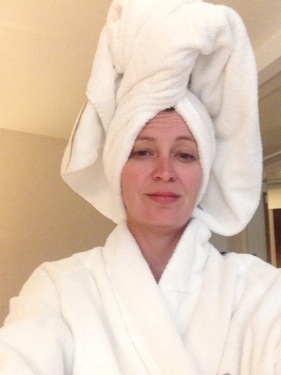 She graciously offered to write a guest post about her experience with the conference. I was thrilled to read our feelings about our experience last week, mirrored each other. I have been very vocal with my efforts and urgings for agriculture to open our barn doors. But we must do more than offer transparency. We must engage. I plan on covering this topic more, in future posts, but Julia is right, we must use our voices. Today, I spoke up. Today, my voice was heard. 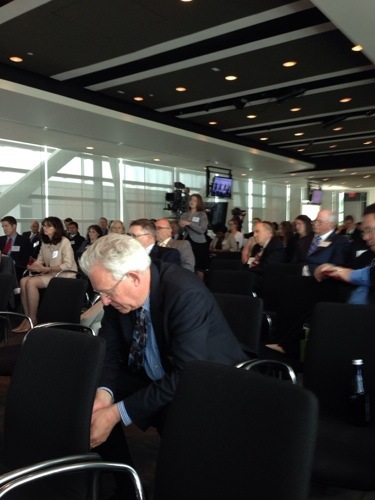 Today, I attended the 2014 National Policy Conference of CropLife America. Did I lose you? Keep reading, it was not just another board meeting. Living in the Washington, DC, area, I take any chance I get to attend broader agricultural events. I seek out information from other commodities, other organizations and particularly other viewpoints CropLife brought together speakers from all sectors of agriculture and conservation, from a sixth generation California cattle rancher to Honest Tea to the Nature Conservancy. Ali Velshi, formerly of CNN now with Al Jezeera America, was master of ceremonies, artfully weaving crowd comments into poignant debate. One speaker answered an Ali Velshi remark saying, in his work, he gave a voice to the emotive opposition to the stiff scientific claims on a very contentious topic (to be named on another day). Neurons flared! I had a question. Why did this emotional, sometimes misinformed, perspective get equal voice with a life-saving technology, scientifically safe and valuable? Furthermore, if both of these viewpoints had equal time and space, did readers or listeners really even consider the other side of the argument? Or did they simply laserpoint in on the viewpoint they already shared? Burning questions! But, in a room full of experts, I was shy to stand at the microphone. So, I tweeted it. And, bam! there it was! Asked by Ali Velshi on a national stage. Success! Well, except for the fact that I spent so much effort into smartly wording my question that no one could understand it. Communications fail. The question was answered, in its own way, but after a break and another panel, I decided to give it another go. So, I approached Ali Velshi (gulp!) and explained myself. Little did I know what would be the outcome. After lunch, a panel of journalists took the stage. And, true to his promise, Ali Velshi retooled my question and posed it again. The topic took off! The entire room was engaged (some even enraged)! Just because I had taken the time to go and explain my less than 140 characters in person. The panel continued their discussion and the conversation grew more heated. And I grew bolder. So, after conflicting comments, I DID step up to the microphone. In front of a room full of those with far more experience and far more expertise than myself, I posed a second question. A visible reaction from the audience. And an even greater emotive response from the panel. So much so that I followed up with one of the speakers to further continue the train of thought after she left the stage. My takeaway today, just as much as the specific issues we discussed, use your voice. And you will be heard. I could have sat there, thinking about my observation. I could have typed it in my notes and talked about it with my boss come the next work day. I could have said nothing, done nothing – and absolutely nothing would have been the result. So, the next time you are sitting in the audience at an event – large or small – move from passive to participation! If you have a question or a comment that you want the answer to, do not be afraid. Instead, just use your voice. You never know who might listen if you do. PS: Ali Velshi is welcome to a good conversation at my table anytime. PPS: If anyone has any ag-related questions they want to ask, please do! Ask away – I may not know the answer, but I will hep you track down who does! Julia Debes is the Assistant Director of Communications at U.S. Wheat Associates where she tracks news on the wheat industry as well as puts together newsletters and other publications. She’s also a fifth generation farm girl from central Kansas, where her parents operate a wheat and cattle operation. 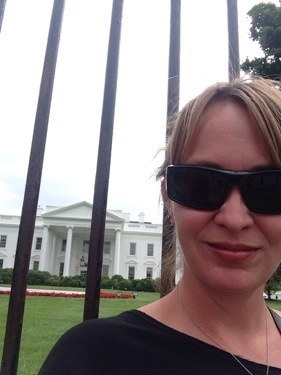 As you all know, I went to Washington D.C. to speak on the CropLife America 2014 Policy Conference. Of course I am going to write a ton about it, but for now, because I’m still stumbling around in a daze, asking myself if that really just happened, I’m posting some Felfies I took. 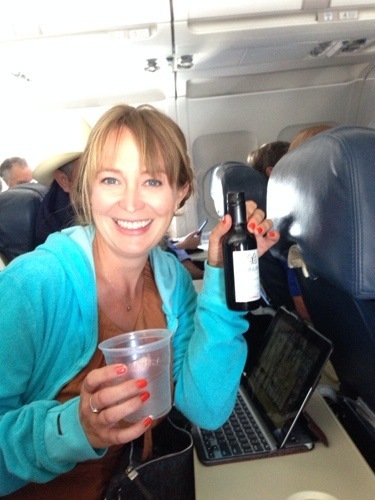 They had little wines on the plane! After I finished it, I realized I was going to miss my connection flight. It’s cool though…. 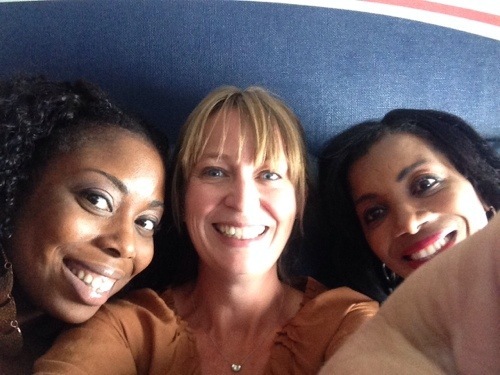 Because I got to meet Keedi and Dana! They never spoke to a 6th generation cattle rancher before, so we had a wonderful conversation that made our flight time zoom by! My hotel was super nice. I may have enjoyed it a whisper more than I should have (but come on, I live in a barn!). I had one free day to roam around D.C. and let me tell you, I put some miles on my poor little feet! 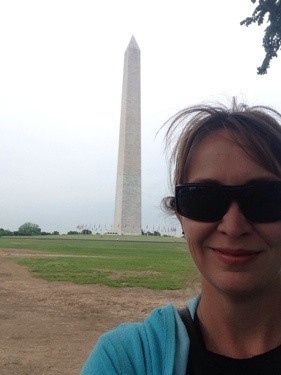 Felfie with the Washington Monument. 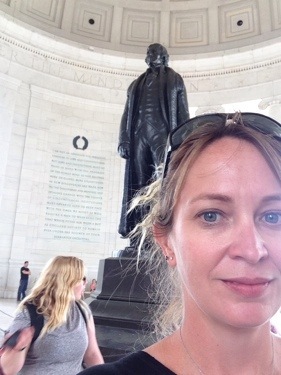 I love the Jefferson Memorial. He was such a powerful thinker. 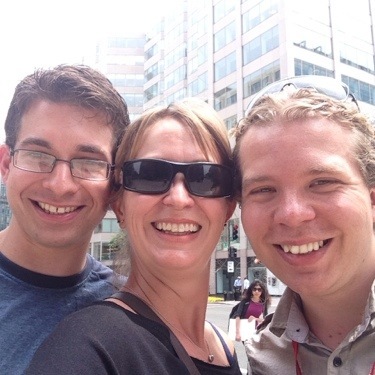 I finally got to meet my friends Tim and Alex and spend some time with them. They took me on a walking tour of parts of the City I never would have seen, it was beautiful!! We had dinner the night before the conference with the other panelist. 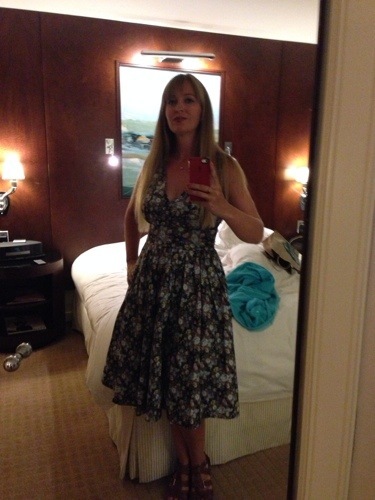 I didn’t have any cow poo on me AND I wore make-up! 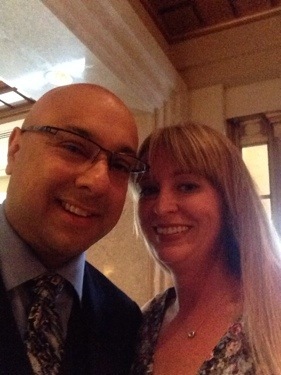 Folks, my felfie with Ali Velshi, the crowing glory of my felfie collection. I was a tad star struck. 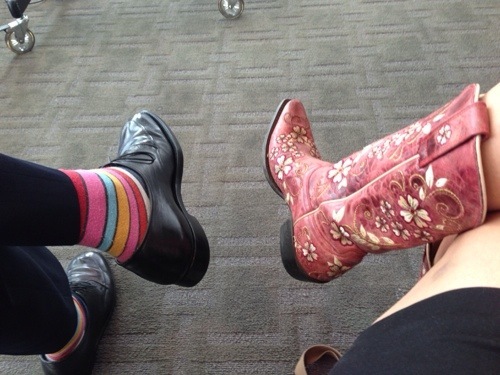 Ali Velshi has some badass socks, but I think my boots can hold their own. And finally, this cowgirl went home. This conference was one of the most incredible things I’ve ever had the honor to be involved with, and I was so grateful for the experience. Next week they will be posting videos of the conference, so I can share more! I leave tomorrow morning for Washington D.C. to be a panelist for this conference. Ecstatic does not begin to describe how I feel. This is such an amazing opportunity for me. 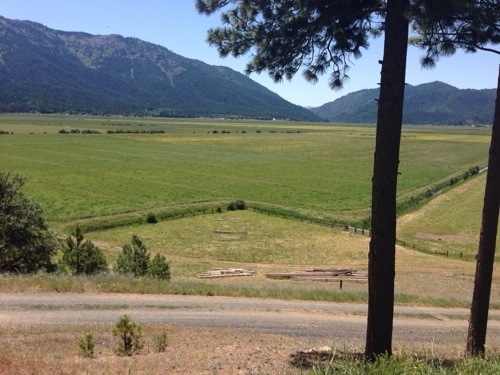 I am especially excited that I was invited as a rancher – I feel like our voices are slowly starting to be heard and valued. This is be live streaming, so if you’d like to watch me, please go here for more information. If you have a twitter account, please use hash-tag #NPC14 to following along! Fair warning Dear Readers, I know this conference will inspire and teach me. Be prepared for lots of posts and pictures about it! 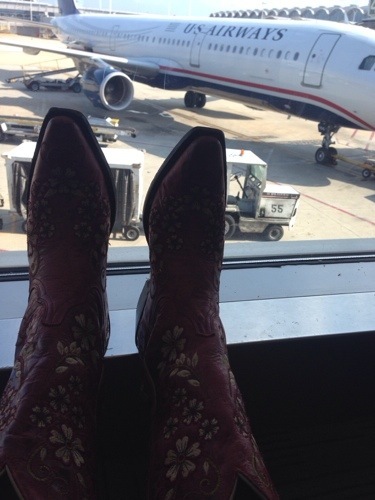 Tagged as #NPC14, Ag Hag, CropLife America, Croplife America 2014 National Policy Conference, excited, field trip, KACF, Megan is leaving the Ranch, Washington D.C.
How I Lost My Voice…..
Life is never dull on a ranch. One moment you are making deviled ranch eggs and raiding your Parent’s freezer for a BBQ and the next moment you are screaming bloody murder because one of the biggest rattlesnakes you have seen lately is right where you park your truck. 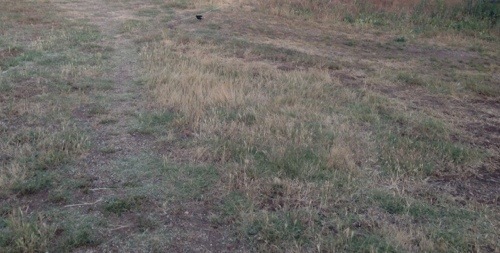 I noticed the black birds making a fuss, I didn’t think too much about it until I spied this guy (see the snake?) 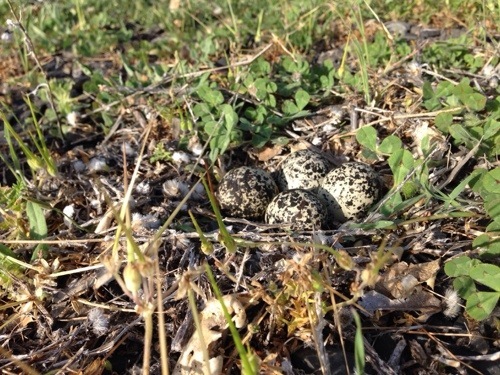 by the bird. I just had a very upsetting nightmare where I stepped on a rattlesnake but I didn’t kill it, I was screaming for help, but no one could hear me. I was stuck on a mad, live snake! I knew I was going to die!!!! When I saw this snake, I put everything I had into screaming for help, just in case my dream actually came true! Snake in the circle of trust (near the houses and pets). 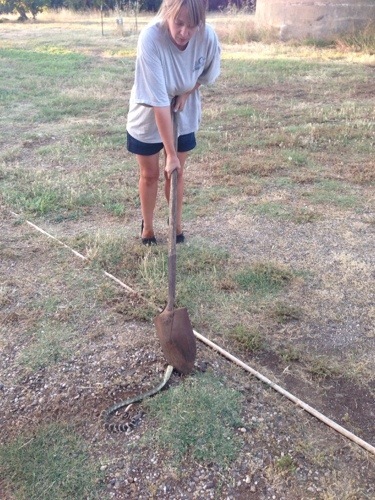 Thankfully, my Mom did hear me and helped kill this bad boy snake. But not before I managed to hurt my vocal chords by screaming like a Banshee. After we killed it, I went back to get the rattles and it moved and peed on me, so I screamed again. That probably didn’t help my voice either. 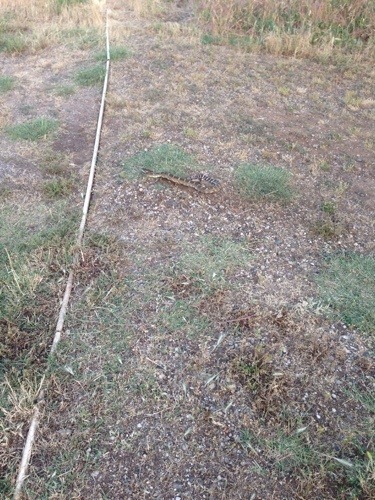 When rattlesnakes are this close to our homes and pets, we don’t think twice about killing them. They do not need to be in the circle of trust. We always are careful to remove the snake’s head to prevent any accidents. We’ve heard enough horror stories about people getting bitten after the snake was killed or meat bees eating the poison and stinging people or animals. The head is placed into a bag and thrown away, safe from meat bees and animals. See this cow’s upper back leg? This is what a snake bite looks like. 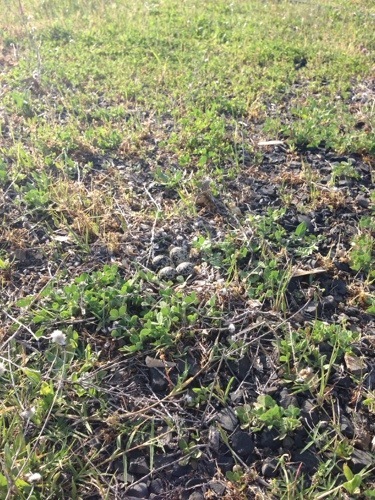 Rattlesnakes are a fact of life here on the ranch. 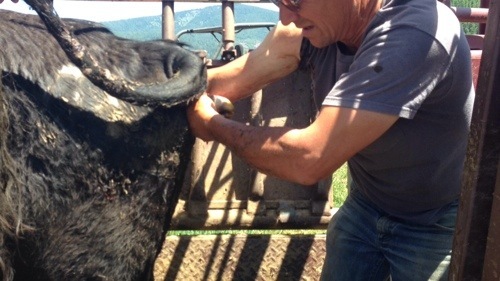 Inevitably, we always have at least one cow or calf get bitten every year. Worst case scenario is the animal dies. 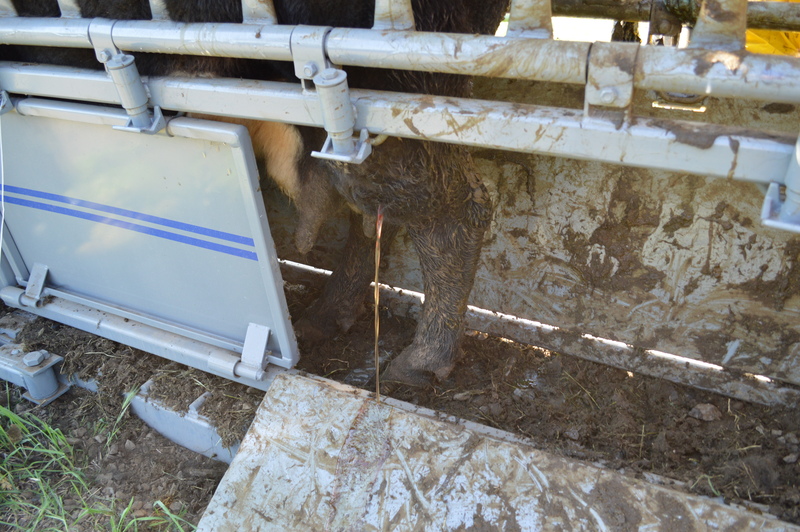 The best case is we have a hurt cow or a calf that will never fully recover. A full year later, we are still treating the bite. We had to lance her wound. It is always upsetting when we kill a snake around the houses. Although we know the snakes are here, we don’t often see them, so we can pretend they don’t exist. But then you have a scare, and it is ALWAYS when you aren’t paying attention, wearing your office flats (not snake boots) and you have a puppy frolicking at your feet. For the next few weeks, we will be on high alert, every stick will be a snake, the wind moving the leaves in the trees will be upset snakes! Eventually we will relax again, but the cycle will continue. Many of my musician friends ask for the rattles to place in their guitars, they say it improves the sound. Everyone is safe and healthy, so this was a good reminder that we need to pay attention. Well, maybe not totally healthy…. I really did hurt my vocal chords when I screamed. Ever since we killed the snake, I’ve been a raspy, squeaky mess. I am a whisper nervous about this because on Thursday I am going to be a panelist at the 2014 CropLife America Policy Conference . I’ve been trying not to talk and eating lots of ice cream and drinking lots of honey tea, so I know I’ll be fine! If you have a few minutes Thursday morning, please consider streaming this event on your computer! I am so excited to be apart of this and want to share it with my readers! How often do you get a paycheck from your job? Once a month? Every two weeks? Once a year? 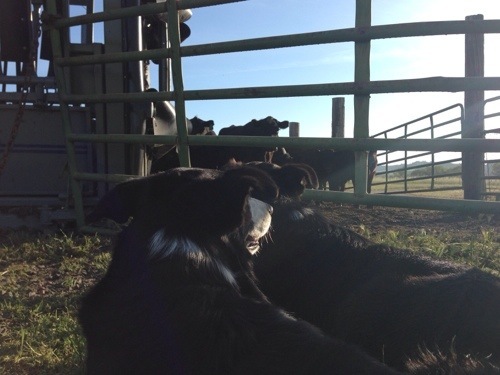 Dogs, helping with the cattle. For many of us in agriculture it is normal to receive one or two paydays a year. That is it. We must budget those few paydays to last, and with all the unknown variables that are apt to happen in agriculture, that can be a huge challenge. For us, payday is when we sell this year’s crop of animals or harvest. 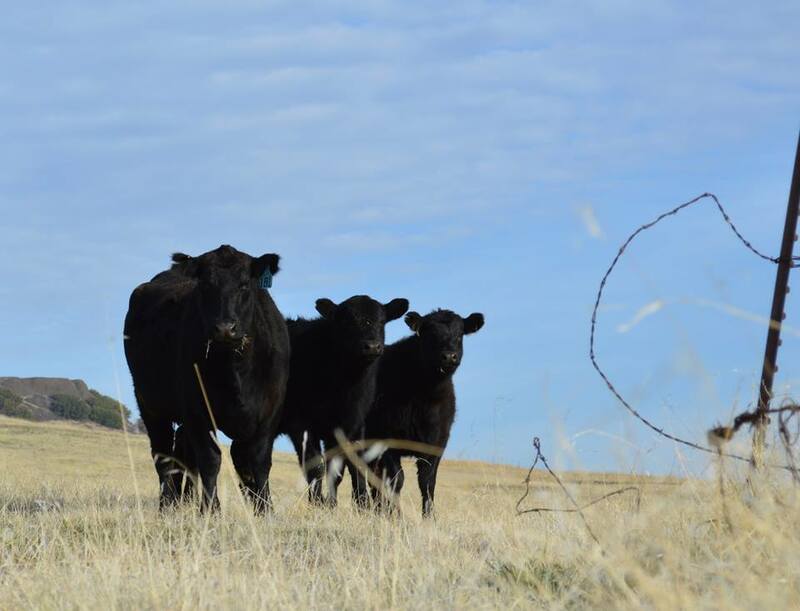 For farmers and ranchers that specialize in one product, like beef cattle, we work all year for this one day. Where our cattle live in the winter. We sold this year’s calf crop today. As I was sitting at the auction, I realized that not many people outside of beef production, get the chance to experience what I experienced today. 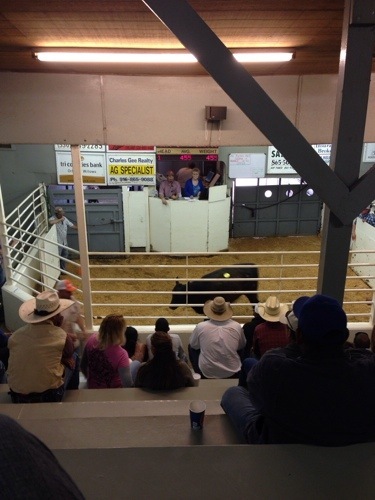 I want to show you what a cattle sale looks like. What an average animal sale looks like. But first I want to talk about what it took for us to get to this point. This calf crop is the result of almost two years of work. 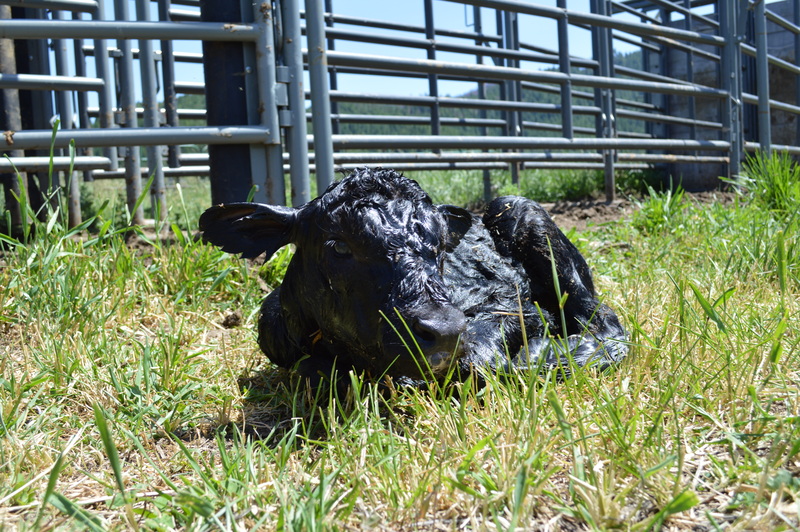 From planning the pregnancies of our Mama cows, to the birth and growth of the calves themselves. Look at this little cowgirl. 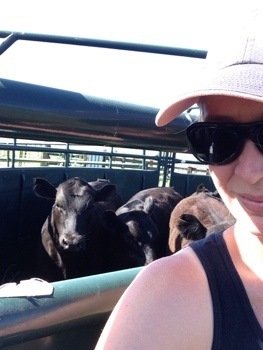 The calves we sold today were almost a year old. My family has spent every day since before their conception with this herd. We selected the bulls we felt would best improve our herd, we watched as the Mama cow’s bellies grew, we helped them give birth, we spent countless hours watching and protecting them. If you want to know more about the process, please look through the Beef archives to the right of this post. This is when we de-wormed and vaccinated our babies. When we watch the sale of these calves a whole range of emotions course through us. Part of you wants to grieve for the loss of these animals that you have spent so much time with, becoming attached happens regardless. Part of you feels pleasure, watching these beautiful animals walk around ring. Then you feel thankfulness because you have successfully brought them to market. Often feeling incredibly proud is yet another emotion, the knowledge that I am helping to feed my country is amazing. 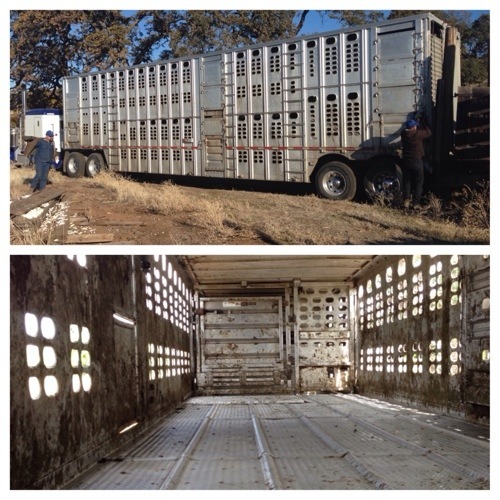 This is how we ship our cattle, in huge cattle trucks. The bottom is what they look like inside. Needless to the blend of emotions causes a lot of stress, anxiety, but eventually relief and in a good year, joy. 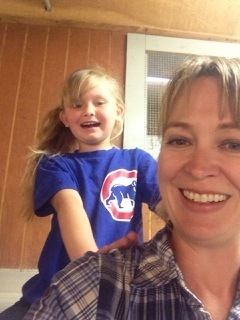 My little cousin was giving me a back rub to help with the stress of selling our cattle today. It was a nice treat. 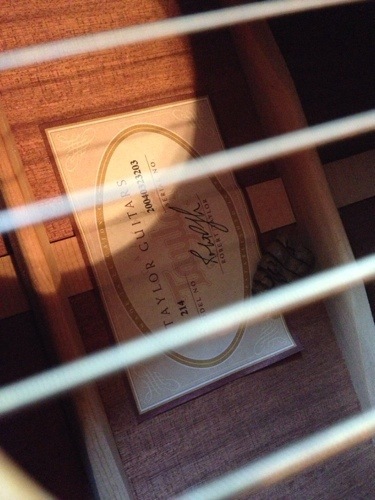 Ok, now on to the auction part. If the past we’ve sold our cattle multiple different ways. From video sales in years past to a more traditional way of literally taking them to market. Each method has it’s pro’s and con’s, but we’ve been very happy with both. Hopefully, this summer I can attend a larger video sale and go more in depth about it for this blog. Our family is grateful for today to be over. Our emotions have been all over the map and we will talk about nothing else amongst ourselves for the next few days. 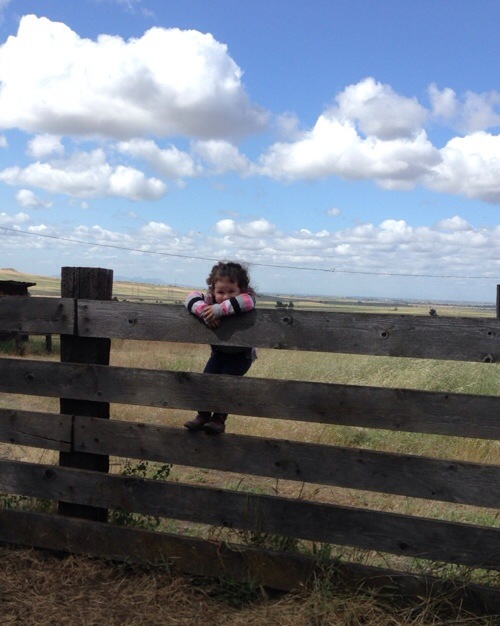 However, we are thankful that we can continue to do what we love and look forward to many more generations of ranching. We are excited to expand our grass-fed meat program! We are offering a chance to buy a live beef animal share! 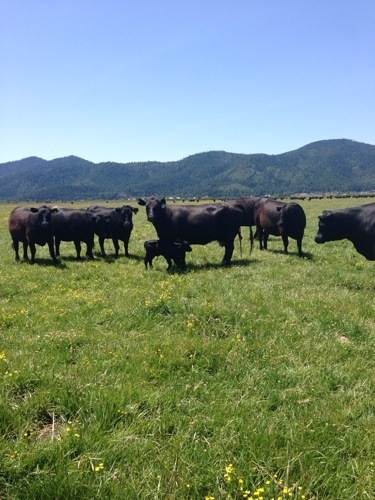 As always, our certified Natural Black Angus cattle have never been fed grain, never received any antibiotics or added hormones. 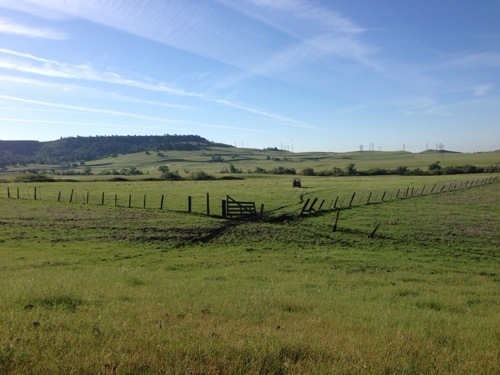 They have lived their lives peacefully and humanely on our 6th generation cattle ranch, enjoying winter and spring in the Sacramento Valley and a second spring and summer in the beautiful Sierra Nevada Mountains. A petite share – 10 lbs of hamburger for $55. A small share – 20 lbs of hamburger for $105. A medium share – 50 lbs of hamburger for $250. A large share – 100 lbs of hamburger for $475. A paleo share – 200 lbs of hamburger for $900. Please contact Megan Brown (530) 518-4432 or megrbrown@gmail.com for more information. 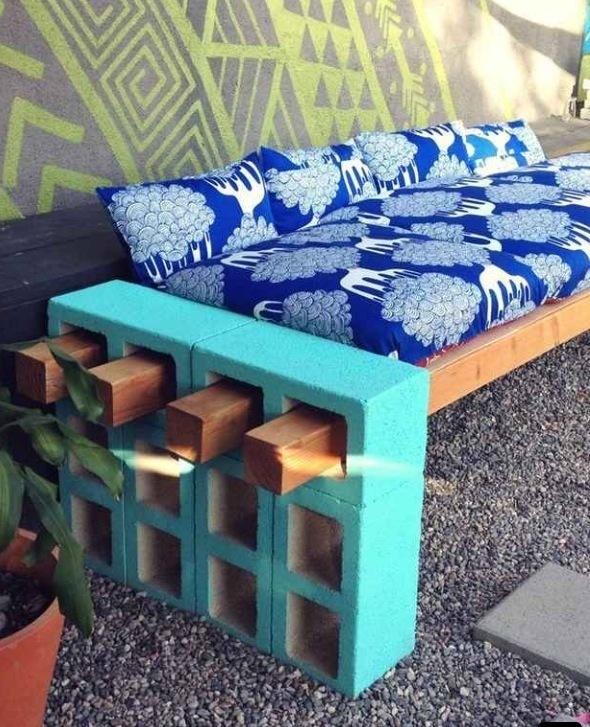 This “couch” was perfect for my yarden, and perhaps as a Mother’s or Father’s Day gift? Plus it reminded me of college. I spend a great amount of time outside in my yarden, and it’s hard to find durable, affordable patio furniture. 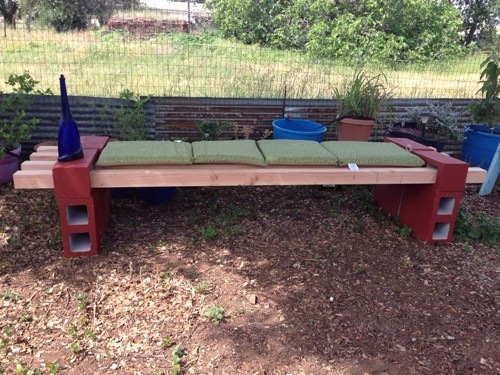 And since my yarden is a constantly evolving project, I need to be able to move my furniture around, again, this was perfect! I used the tutorial from The Basement, and it worked great! 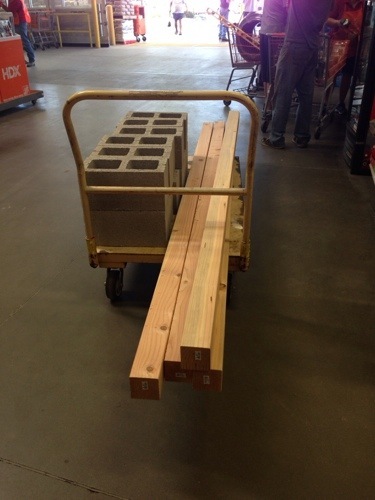 If you are really nice to the Home Depot workers they will load all this stuff on your cart and in your truck! 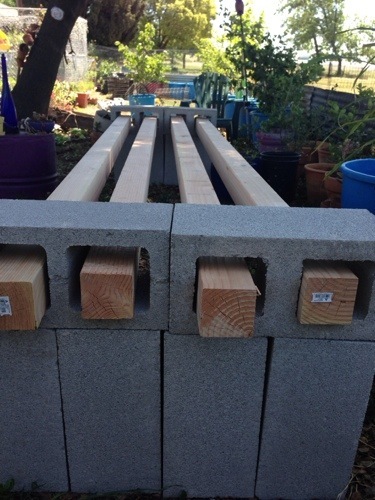 The lumber and blocks cost $67, the paint was free (I “borrowed” it from my Mom), and the cushions were $30 and it took me mere minutes to set up. Winner, winner, chicken dinner! The hardest part was packing all this stuff into my yarden from the truck. Make sure your ground is level, or this will not work well at all. Trust me, I learned the hard way. I assembled it in a jiff! I’m going to stain this wood, just so it lasts longer. Add some paint and a wine bottle, mosquito oil lamp and you are ready to relax! 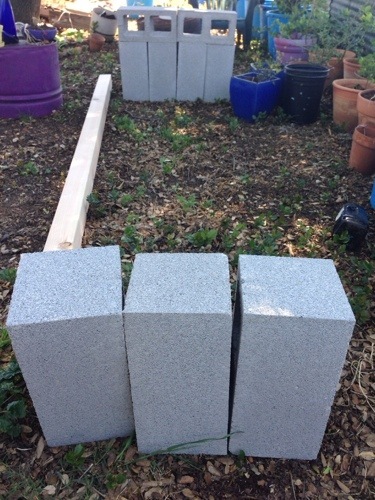 In the other tutorials they used adhesive to glue the blocks together. I did not do that. I felt like it was sturdy enough, and I plan on moving it around. All in all – I spent about $100 and an hour painting and putting it all together. I felt like it was worth the time and money. In fact I might cut the lumber in half and make “love seat” sizes next!